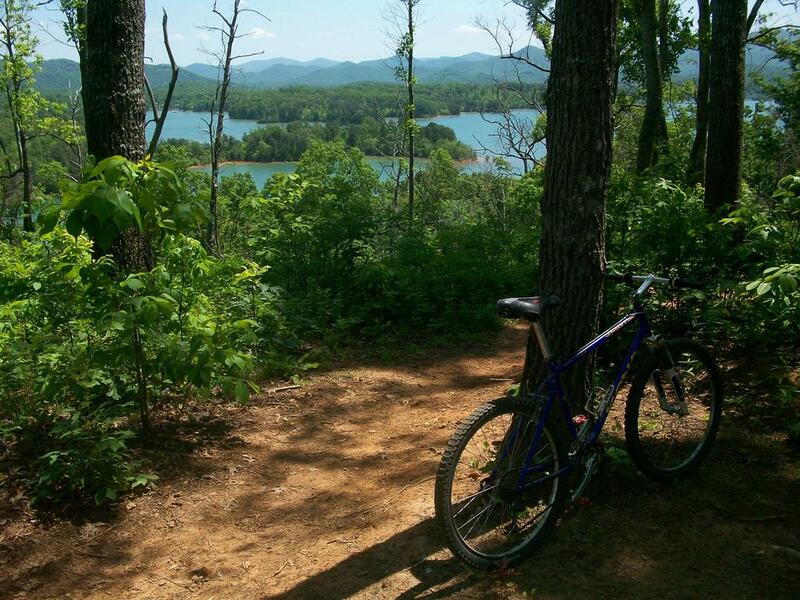 Jackrabbit Mountain is a relatively new trail system located along the shores and hills beside Lake Chatuge near Hayesville, NC. The trails wind along the shores of Lake Chatuge and up into the low ridges on the peninsula. As a purpose-built trail system with mountain biking in mind from the start, Jackrabbit Mountain has quickly become quite a popular place to ride. The lake at the end of the SABA Beach trail, a nice spot to relax or go for a swim. 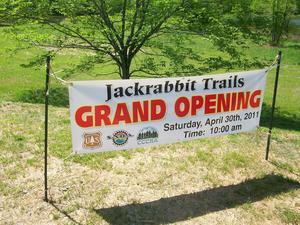 Jackrabbit Mountain on Grand Opening Day. While advanced riders looking for a more casual outing will find some features they'll enjoy here, these trails are well suited to beginner or intermediate riders, having no truly significant climbing or long technical stretches. 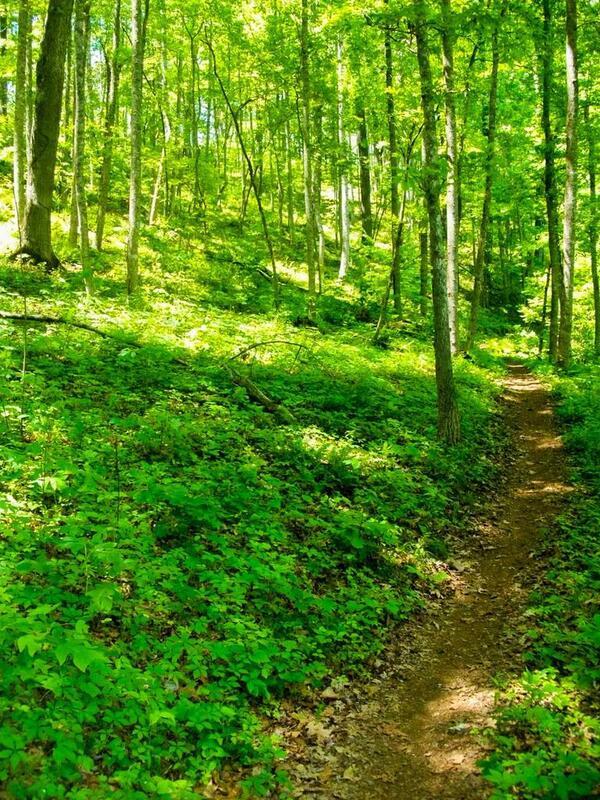 These trails were constructed over a period of over 5 years through professional and volunteer labor, representing a great addition to the trail inventory in Western NC! 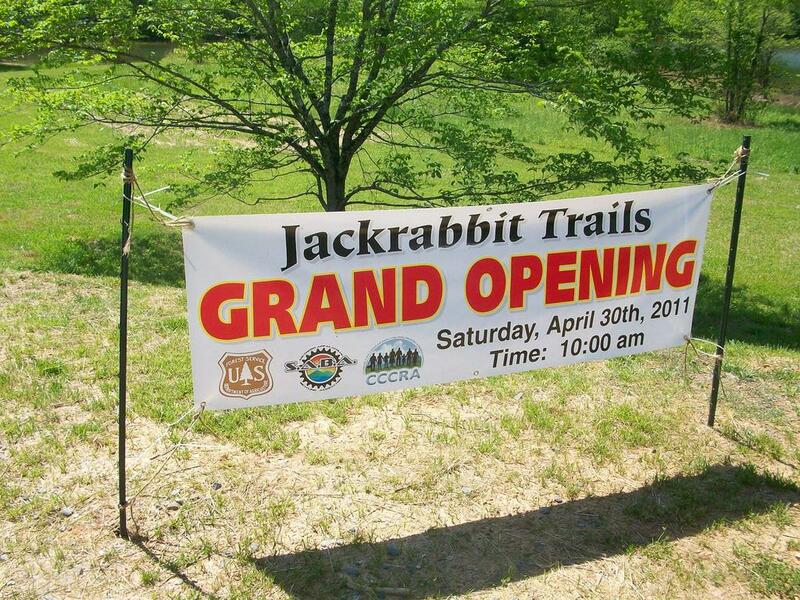 On Saturday, April 30, 2011, the Southern Appalachian Bicycling Association (SABA), along with local officials and federal agencies, celebrated the official opening of the new Jackrabbit Mountain trail system. Held at the trailhead, the event included speeches and slideshows, a ribbon cutting, group hikes and mountain bike rides, barbeque, and lots of great weather. The summit of the hill over which the High Point trail travels offers up a little spot to stop and enjoy a limited view of the lake and mountains beyond. 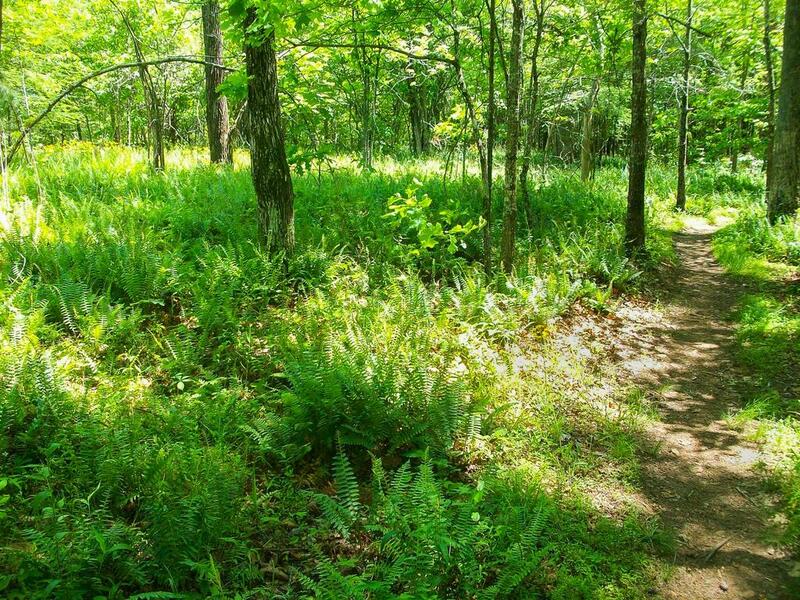 The Burnt Tree Peninsula trail passes through this little fern-filled opening in the woods. A main central loop, which is easy and nearly level, has junctions with several slightly more difficult side trails and loops. Some more technical features (rocks and deliberately constructed features) and climbs are present on the side loops. 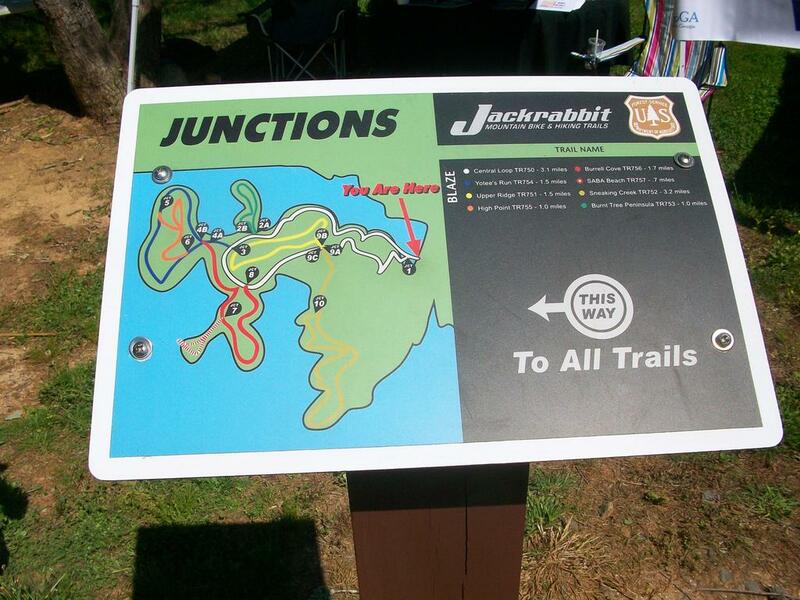 At the main parking area, there is a short skills trail for beginners to brush up on their technical skills before hitting the main loops, meaning Jackrabbit is also a great place to introduce the kids to the sport. This odd covered bridge crosses the only real stream at Jackrabbit Mountain, on the out-and-back portion of the Sneaking Creek trail. 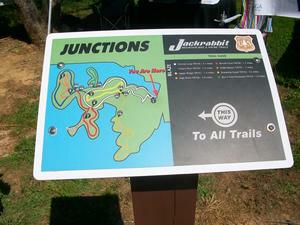 All trail junctions are well-signed at Jackrabbit Mountain. You'll definitely want to check out the SABA Beach trail - right at this junction - if you're riding the Burrell Cove trail. 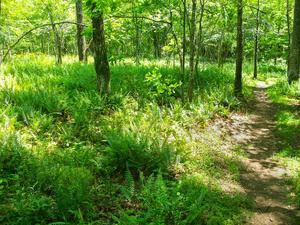 The Yotee's Run trail passes through these nice, open woods at the bottom of the hill near the lake. The High Point trail loops around at the top of this hill. Scenery wise, there's not much along the main loop besides small trees and glimpses of the lake (better views when the leaves are off), but the side trails go to some more interesting destinations such as ridgetops and sandy beaches. The forest here is mostly young, having been logged with a type of selective logging technique in the not-too-distant past, and there is some poison ivy to contend with. There are no real stream crossings to speak of, but the lake is always close by. The area is at a relatively low elevation with sunny openings in the forest, so it'll get hot here in the summer in comparison to nearby areas like Panthertown Valley or over in the Pisgah Ranger District. Bring plenty of water and pace yourself on those hot days. A swim at SABA beach makes a great stop during those times, too. For see all the trail details, visit the Trails page or see our GPS Map of the trail system. Picnic Tables at the Trailhead. Fuel up before or after your ride! 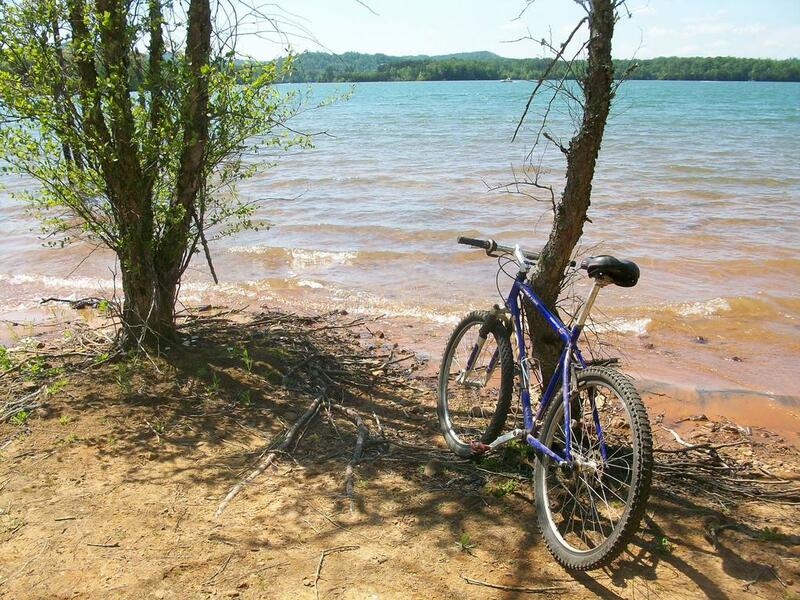 At the trailhead parking area, there are plenty of parking spaces, pit toilets, maps & information, and a grassy field with picnic tables and grills by an arm of the lake. Drinking water is also available. Camping is available right next door at the Jackrabbit Mountain Campground, which is on the lake shore. 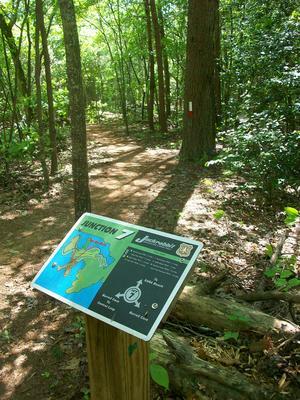 A trail is planned to connect the trailhead with the campground, but for now, you can ride along the road to get there without driving. The campground is open May thru September. It offers three loops with 99 sites for tents or trailers, but no hook-ups are available for RVs. 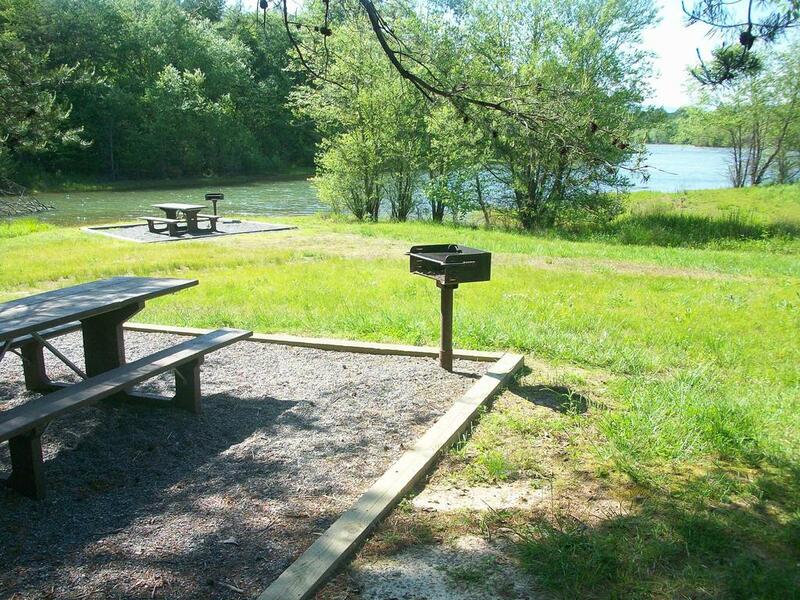 Each site has a picnic table, fire grill, tent platform, and parking spur. Accessible flush toilets, hot showers and drinking water are available. Nearby are a two-vehicle-wide boat ramp and two picnic shelters. For more information or to make a reservation, visit the Jackrabbi Mountain Campground's page on Reserve America. There are more hotels nearby in Hayesville and also a bit further in Murphy (about a 30 minute drive). 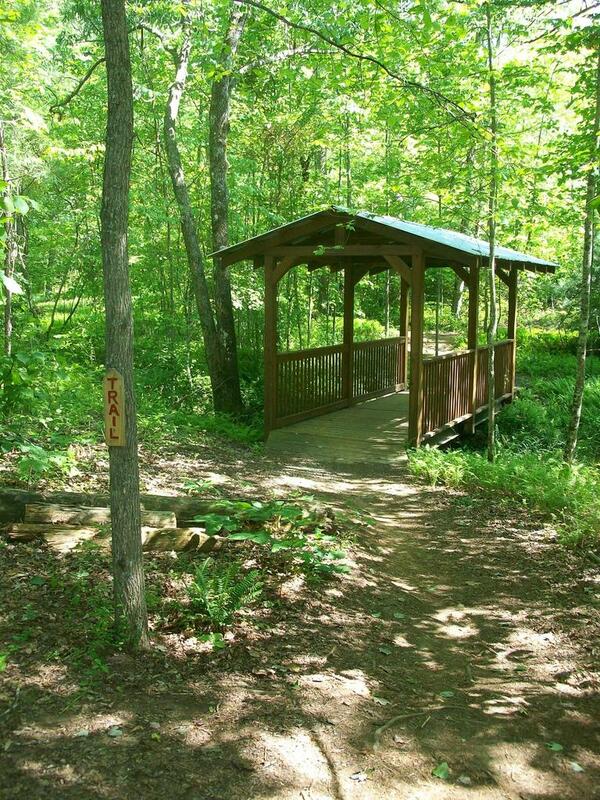 The trailhead is located closest to the town of Hayesville, N.C., not far from either Murphy or Franklin on US Hwy. 64. Follow US Hwy. 64 East for 18.9 miles and turn right on NC Hwy. 175 South. Follow US Hwy. 64 West for 28.3 miles and turn left on NC Hwy. 175 South. Go 0.9 miles and turn right to stay on NC Hwy. 175, crossing a long one-lane concrete bridge over an arm of the lake. Go 2.5 miles and turn right onto Jack Rabbit Road. Bear left after 250 ft., staying on Jack Rabbit Road. The signed parking area is on the left after about 1/2 mile. (The campground is straight ahead at the end of Jack Rabbit Road).